This Chocolate Molten Lava Cake is really quick and simple to prepare! Make this within 10 minutes whenever craving for some chocolate! In a mixing bowl, sieve the All purpose flour, castor sugar, cocoa powder and baking powder together. Add the vanilla essence and enough milk to make it into a thick batter. Roughly chop 5-6 walnuts and add them into the cake mixture. Grease a ramekin with butter or oil and pour the mixture into it. Preheat the oven at 180 degrees Celsius for 4 minutes. Bake the cake mixture for 10 minutes. The top will be firm and cakey, whereas the inside will be molten, gooey and fudgy. 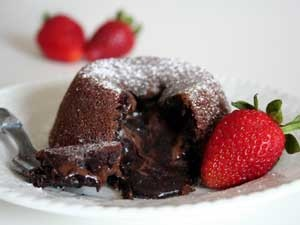 Serve your molten chocolate lava cake in the ramekin itself after dusting castor sugar over it.